The East Hampton Historical Society drew a record crowd of over 600 people for its 2018 House & Garden Tour, now in its 34th year. This year's tour featured five homes showcasing a variety of styles of architecture and the design options for living in The Hamptons. The House & Garden Tour kicked off with a Cocktail Party at the historic Maidstone Club on November 23, 2018, which was attended by history buffs, architects, interior designers, home enthusiasts, design aficionados and supporters of the East Hampton Historical Society. Distinguished guests included Jessie Della Femina, Kendell Cronstrom, Alejandro Saralegui, Pamela Eldridge, Kelli Delaney, Ted Porter, Maulik Pancholy, Barbara Ostrom and others, along with East Hampton Historical Society Board of Trustees members that included President Arthur (Tiger) Graham, James Blauvelt, Jim Oxnam, Barbara Borsack and Dale Ellen Leff. The following day, the East Hampton Historical Society hosted the 2018 House & Garden Tour, which highlighted examples of fine architecture in The Hamptons. "From Sea to Bay and South-of-the-Highway," this year’s tour, offered a rare glimpse inside some of East Hampton’s storied residences. Liz Collins at David Huntting House on the East Hampton Historical Society's House & Garden Tour. Photo: Richard Lewin. Courtesy of East Hampton Historical Society. Homes on the tour included the David Huntting House, circa 1800s; the William H. Babcock House: a timber frame house, circa 1720, that was renovated in 2016-17 by East End architect Kitty McCoy; a custom home inspired by an exclusive Adirondack resort; a sleek Modern home overlooking the Atlantic, infused with warmth by interior designer David Netto; and a new Modern home that channels the quaint cottages that dotted Wainscott for centuries as designed by Jessie Della Femina. Continue scrolling for a look at some of the people who made this year's tour memorable. Susan Macgregor-Scott and Robin Dict on the East Hampton Historical Society's House & Garden Tour. Photo: Richard Lewin. Courtesy of East Hampton Historical Society. Eileen Kenney and Anne Marie Marino on the East Hampton Historical Society's House & Garden Tour. Photo: Richard Lewin. Courtesy of East Hampton Historical Society. 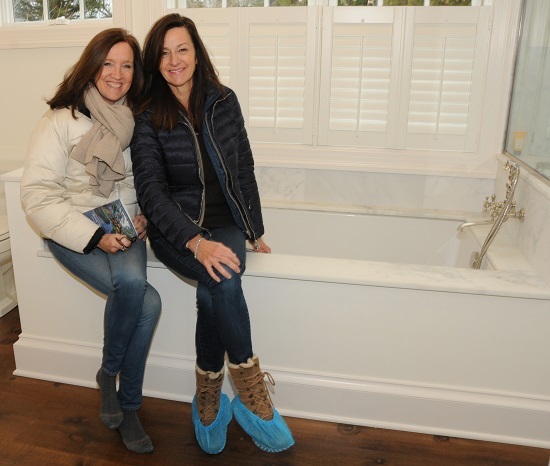 Brooke James and Nancy James on the East Hampton Historical Society's House & Garden Tour. Photo: Richard Lewin. Courtesy of East Hampton Historical Society. The East Hampton Historical Society serves the residents and visitors of East Hampton, NY by collecting, preserving, presenting and interpreting the material, cultural and economic heritage of the town and its surroundings. The East Hampton Historical Society operates four distinct museums, all set in East Hampton and Amagansett, NY. They include Mulford Farm, ca. 1680, the Osborn-Jackson House, ca. 1720, the Clinton Academy, 1784, the East Hampton Town Marine Museum, and the Thomas and Mary Nimmo Moran Studio, ca 1884.